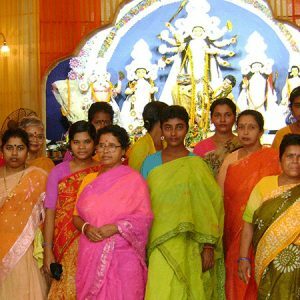 Paripurnata Halfway Home was established in Kolkata in the year 1992 by a group of philanthropically minded people, spearheaded by Dr. Joyce Siromoni. Parpurnata is the first Halfway Home in Eastern India for mentally ill women, who have been incarcerated in the jails and mental hospitals for long periods. It is a psycho-social rehabilitation centre which prepares them for their natural home and to help them re-integrate with the society in general, so that they can once again lead a productive and meaningful life. The mentally ill women from the poor and lower-middle class sections of society, because of their afflictions, mostly have neglected, despised and often tortured existence as unwanted beings in the society. The need to bring about a change in their woeful existence to a socially productive life, motivates this project. The change may be achieved by intervention through psychosocial rehabilitation process. The process comprises medico therapy and socio-cultural therapies, structured to assist the beneficiaries to pick up the lost pieces of their lives and to strive to live as socially responsible human beings with dignity. Paripurnata attempts to achieve its goal through its residential programme in a setting known internationally as a Halfway-Home, so named because it is perceived as the mid-point in a person’s journey from her place of confinement to her home. Here in a humane ambience, the beneficiaries are bought in, to undergo residential rehabilitation programme for a duration spanning from eight to twelve months. On successful completion of the programme, the beneficiaries are rehabilitated in the society. The process calls for personal attention to individual beneficiaries and dovetailing of various activities like pharmaco-therapy, counselling, socio-cultural therapies and occupational therapies including visits to the homes of the beneficiaries, conducting awareness programme, and sensitizing activities and also to follow up on the rehabilitated persons (ex-residents) about their wellness, in the form of house visits, free of cost medicine and counselling, for at least three years. During Paripurnata’s existence spanning two decades, more than 200 women mostly from rural areas of West Bengal, Andhra Pradesh, Gujarat, Chhattisgarh, UP, Bihar, Orissa, Assam and Tripura have been repartiated with an overall success rate of over 90%. Smt. KBC (Name Abbreviated to conceal identity) was found loitering on the streets of Andul, near Howrah station and was admitted to Calcutta Pavlov Hospital by the W.B. Police on 19th May 2010. She was brought to Paripurnata Halfway Home on 24th February 2011 for psychosocial rehabilitation. She was about 38 years old and was married. Apart from Gujarati, she had a smattering of Hindi and a nodding acquaintance with English words. She was quite reluctant to open up—this somewhat acted as an obstacle to ascertain her life story, initially. Gradually she opened up and started speaking to her counsellor. Her condition started improving at (Image : Smt KBC wecolmed to Paripurnata home) a satisfactory pace. It came to light that she is the daughter of Shri RSC, a teacher from Palanpur, Gujarat. She had two children and was very anxious about their welfare, as she thought that, she had left her two children in the train. She was fond of stitching sessions and use to sing bhajans in the music classes. Finally, after a long interval of another seven months and many a phone calls, her father, came to Paripurnata in February 2012 and took custody of his daughter. He expressed his gratitude to Paripurnata for looking after her daughter during her time of distress. As of now Smt. KBC is assisting her father and her two sons,are staying with their father and are allowed freely to visit her occasionally. She remains in touch with many staff of Paripurnata since then. Smt. SS (Name Abbreviated to conceal identity), aged about 26 years, is a resident of Bihut village of Barauni junction in Bihar. Her family members got her married to a farm labourer in a nearby village, when she was in her late teens. Soon after her marriage, she was being tortured by her in-laws, who were demanding more dowry. As she couldn’t take the daily beatings and abuses, she left the in-laws’ home and went to her brother’s place. After a while, she was married again. In the meantime her mental problems manifested. She left the home of her second husband and somehow reached Kolkata. In December 2012, Kolkata Police apprehended her and was brought to Paripurnata for psychosocial rehabilitation on 27th May 2013. (Image : Smt SS being welcomed to Paripurnata with clothes) She was a good natured and active woman and responded well to the treatment and therapies. She was fond of ‘block printing’ sessions and was adept at gardening. In March 2014, she was found to be mentally stable and fit for discharge. During the intervening period, the local police contacted her home town but nobody from the family came to take her back. They informed Paripurnata that the family is very poor and they are afraid to travel outside their village. Finally two of Paripurnata’s staff members went to Bihut to place her with the family. On 28the June 2014, she was handed over to her family. After nearly one and half year, a tearful Smt. SS was reunited with her much relieved parents, brother and the near and dear ones. One month support to a mentally ill woman, who is undergoing psychosocial rehabilitation.